Look westward at nightfall to see the Pleiades star cluster above tonight’s smiling lunar crescent. As seen from middle and far northern latitudes, the moon and Pleiades stay out well past dark tonight. For an extra treat, note the soft glow of earthshine on the moon’s dark (nighttime) side with the unaided eye or binoculars. You might be able to spot the moon and Pleiades from middle latitudes in the southern hemisphere. It’ll be difficult, however, for the duo sets soon after dark in that part of the world. Look more in your northwest sky and low to the horizon about one hour after sunset. At mid-northern latitudes, the Pleiades cluster stays out until late evening in early April. That will change in the weeks ahead, because the the Pleiades set about one-half hour earlier with each passing week. Moreover, the sun keeps setting later as spring approaches summer. Each day, the Pleiades cluster sinks closer to the glare of evening twilight. The Zuni of New Mexico (link has audio) called the dipper-shape Pleiades cluster their “Seed Stars.” The Zuni intently watched the Pleiades at springtime, noting when the “Seed Stars” first disappeared into the spring evening dusk. When the “Seed Stars” dropped out of the evening sky, the Zuni knew that the danger of frost had passed and that it was safe to plant their seeds. How much longer will you see the Pleiades in your sky? 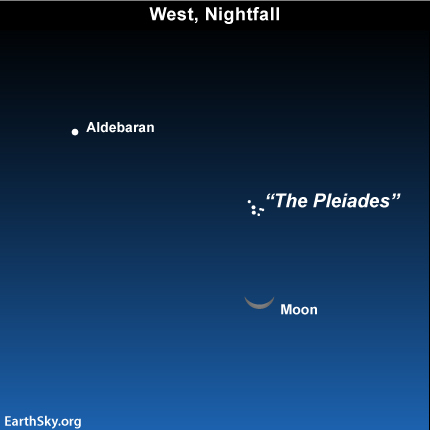 Start watching tonight, looking for the Pleiades star cluster above tonight’s waxing crescent moon. Site contents copyright © 2019 Recorder Online	except as noted. All rights reserved. | 85 queries in 1.112 seconds.